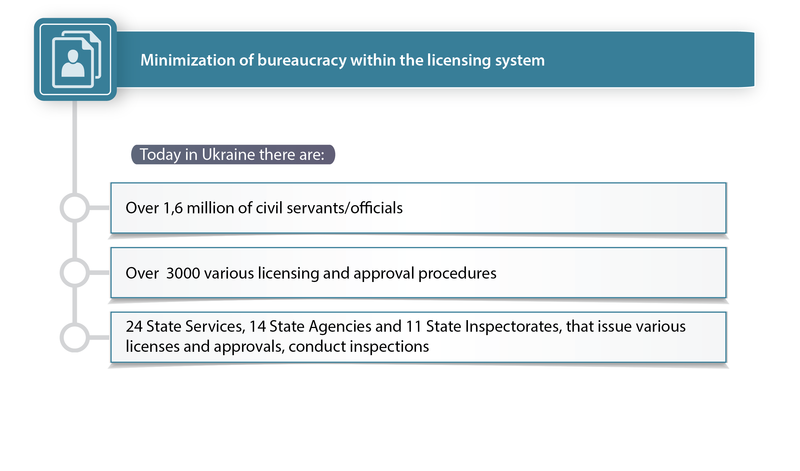 Too much of the budget funds in Ukraine are being spent on maintaining the state apparatus. These funds go to the officials, who are engaged in issuance of documents, 90% of which, according to the business, are not needed. – Over 1,6 million of civil servants/officials. – Over 3000 various licensing and approval procedures. – 24 State Services, 14 State Agencies and 11 State Inspectorates, that issue various licenses and approvals, conduct inspections. We believe that Ukraine needs a systematic approach to deregulation, restriction of intervention of officials into business activity, simplification of rules to conduct business, creation of conditions for the fair competition and ensuring real protection of entrepreneurs and consumers. Therefore, the obvious and primary step is inventorying, together with business, of all authorization documents and regulatory procedures, establishment of programs of their phasing out. We are setting a goal to abolish and to combine a part of inspectorates, to reduce the number of licenses and authorization documents, to make the procedure of their obtaining simple, easy and without corruption risks.